Big Brother 19 spoilers tease Paul Abrahamian is under social media fire for being a “racist.” The vet planned to dress up like a snake in black face during the week 3 POV meeting, complete with leggings, dress, and a black mask. Many social media users believe that it had a racist vibe to it and called for people to stop supporting Paul. 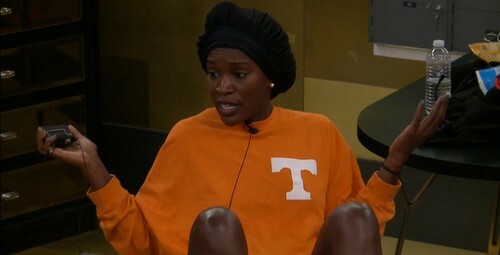 Flashback to 5:45 a.m. Saturday, July 15, Paul asked Dominique if he should hiss at her to come to the HOH room or if he can talk. When she asked what he meant, he said that she called him a snake, so he was acting like one. She followed him upstairs, and they hashed out their differences. Flashback to 5 p.m. on Sunday, July 16, Paul asked Jessica Graf and Elena Davies to help him dress up like a snake for the POV meeting. He revealed that he wants to wear a snake pattern dress and borrow Christmas Abbott’s python patterned leggings. Jessica told him to slick his hair back and wear a green bandana. Big Brother 19 spoilers suggested that he should wear a mask making his face black. The whole idea was to look like a snake from head to toe. Social media exploded with people weighing in if wearing black face is racist. Twitter users were divided on how they felt about it. Most felt that it could be racist, but felt Paul’s intention was not to offend but to poke fun at Dominique. Here’s the thing, Paul is trying to do damage control. He knows his safety net is over next week, so he’s trying to make light of the snake comment, so it doesn’t become a road block for his game. He was obviously worried that Dominique could end his game, so he is trying to discredit her by making it a joke. Does that make Paul a racist? Probably not! It does make him insensitive, but he’s playing Big Brother and sometimes you must play dirty to get ahead. Do you think Paul dressing up a snake with a black mask makes him a racist? Don’t forget to come back to CDL for more Big Brother 19 spoilers, news, and live feed updates.